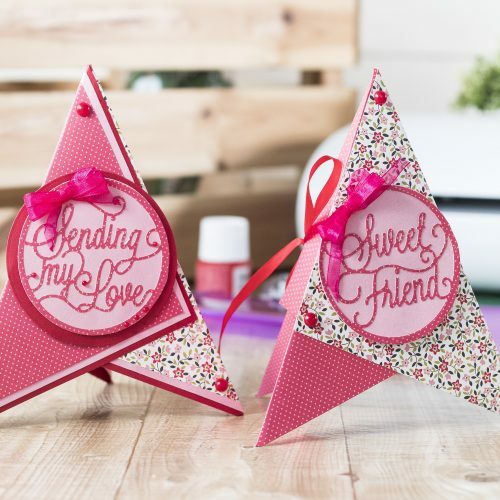 The wonderful Dawn from Dawn’s Inspirations is back and this time she is giving us a super handy masterclass in ‘Matting and Layering’. Keep reading to see how this quick and easy technique takes your papercraft projects to a new level! Sit back and enjoy this video, in which Dawn shows you how she used pretty papers and her Scoremaster to make a stunning project! Cut 3 at 6” x 6” from a coordinating colour Matt Cardstock Pad – Red. Cut 3 at 5 ¾” x 5 ¾” from a coordinating colour of Matt Cardstock Pad – Pink. Cut 3 at 5 ½ ” x 5 ½ ” from a coordinating colour Printed Paper Pad – 2 of Flower pattern & 1 of White Dots. Using your Scoremaster score each square from one point to the opposite point. Now lay these out sticking the top diamond shape to the bottom 2 square shapes – See the video. Next fold your Teepee Card together and make two more score lines before glueing the back panel together. Gentle fold to flatten once the glue is dry. Die cut your embellishments and decorate your card. Your card is now ready to send.